In the solution: 10,000 unread emails? I can solve your problem! 10,000 unread emails? I can solve your problem! Do you have an unsightly number of unread emails in your inbox? 500? 1,000? 10,000? More? You’re not alone. I see many people struggle with the same plight. Others seem proud of the number. Regardless, the good news is that there’s a solution. That’s right. You can cease worrying right now. You no longer need to hang your head in shame when people ask whether you’ve received their email. Or when they ask when you’ll reply. You can jettison your anxiety about encountering an overwhelming volume of email—which only grows larger, not smaller, in the wake of your inertia. The solution? Stop using email. That’s right. No more email! Set up an autoresponder. Inform people who choose to contact you by email that you no longer respond to it. Provide an alternate means of reaching you (assuming, of course, that you want them to reach you. Which you certainly may not, depending on your financial status, fame, professional achievements, etc.). Then delete everything in your email box. Every last email. You’ll feel an overwhelming sense of relief. You won’t be greeted every day by an ever-increasing number of inquiries. You’ll no longer spend precious time thinking about what might be in your email box. Email will no longer matter to you. You’ve banished it from your life altogether. 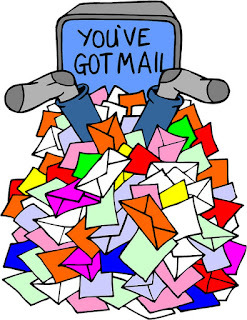 Then again, allowing emails to accumulate unanswered already has been communicating that message. You’re simply formalizing it by your latest action. You’ll rest easier. And the people trying to reach you? They’ll either figure out a different means of connecting, or they’ll give up altogether. In any event, that’s their problem not yours. Right? Delete all your email today. Deactivate your account. You’ll feel a lot happier.